Atrial fibrillation (AF) patients in North America have an increased risk of stroke that is fivefold more than the normal population. This is one of the most common reasons for death among the population of North America. The standard treatment to avoid stroke in patients who are suffering from atrial fibrillation is oral anticoagulation with Vitamin K antagonists such as coumadin or warfarin. The introduction of innovative technologies such as left trial appendage occlusion therapy has benefited patients. At present Amulet and Watchman are the two devices that are approved in North America and are used for LLA therapy. However, a major constraint in using the Watchmen device is the stringent reimbursement policy that does not reimburse the Watchmen device. According to the research, AF affects more than 3 million people in the region and the number of AF cases are projected to increase between 6 and 12 million by the end of 2050. This could lead to an increasing number of LLA procedures and thus heavily cost the U.S healthcare system. Transseptal access sheath dominated the global transseptal access systems market in revenue terms in 2016 and is projected to continue to do so throughout the forecast period. Transseptal access sheath segment is the most attractive segment, with an attractiveness index of 1.7 over the forecast period. The transseptal access sheath segment is projected to account for more than 85% value share of the global market by 2025 end. 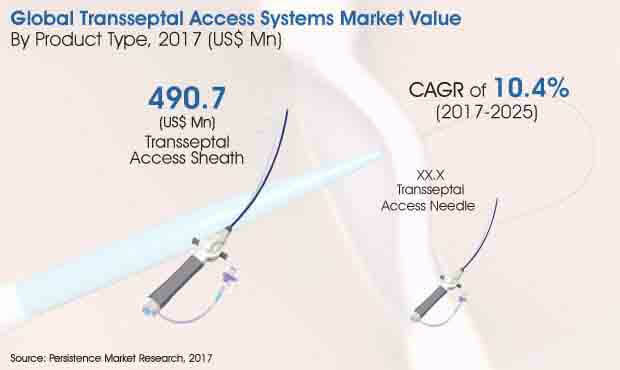 The transseptal access needle segment is expected to be the second most lucrative segment in the global transseptal access systems market. This segment is projected to account for around 14% value share of the global market by 2025 end. Private and government healthcare insurance providers facilitate the reimbursement for disease diagnosis and treatment. Reimbursement of cardiac procedures is covered by various service providers and this is expected to fuel the growth in revenue of the transseptal access systems market. In addition, the continuously evolving reimbursement scenario in the global market coupled with the availability of a mix of payers is also driving the market’s growth northward. Along with this, certain other factors such as an increased intake of tobacco and alcohol and a changing lifestyle of the people leading to a hectic life are common risk issues that can cause atrial fibrillation, which is eventually increasing the number of patients across the globe. Persistence Market Research analysis reveals that the top six companies operating in the global transseptal access systems market held around 88.8% of the global market share in 2016, while the remaining players accounted for just over 11% market share in the same year. Companies active in the global market are focusing on a robust product acquisition strategy to increase their market share and venture into new markets in emerging economies. Also, strengthening of the product portfolio by launching new products with improved characteristics through enhanced product development is a key strategy adopted by some of the leading manufacturers operating in the North America transseptal access systems market.